Many in the Arab world argued that the power transitions taking place within the framework of the so-called Arab Spring will only help Palestinian efforts of self-determination. The logic is as follows: former authoritarian regime protected US and Israeli interests by suppressing the will of the people. By robbing the people of personal freedoms, human rights, and economic flexibility, these regimes have effectively diminished any chance the people had to act in defense of Palestine. Today, citizens can follow through with their own initiatives – to raise awareness or campaign for the Palestinian cause or otherwise. More importantly, it is argued, the countries that have disposed of their former dictators (notably Tunisia, Libya, and Egypt) have elected representatives that are a genuine sample of the the people’s will and desires. While this is far from being a fully accurate statement, one cannot deny that these new governments are a drastic improvement from those that preceded them. 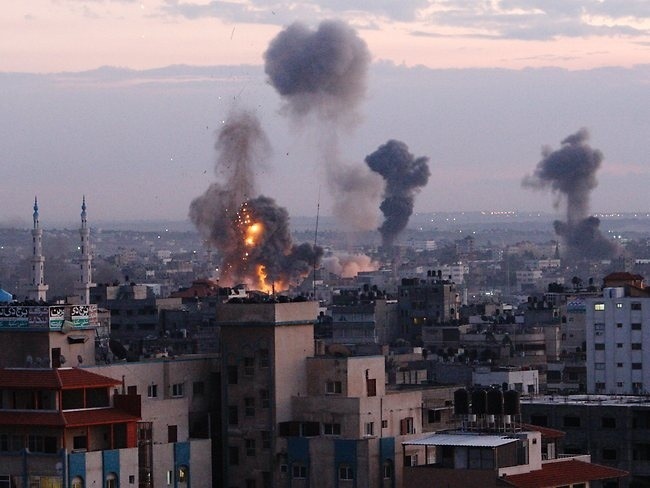 The latest escalation of violence in Gaza has undoubtedly created outrage within the Arab world. According to the Palestinian ministry of health in Gaza, 24 Palestinians have been killed so far, including 8 children, 4 women, 3 elderly. Over 280 Palestinians have been injured. Demonstrations have been held all across MENA in protest of Israel’s attacks. A Tunisian delegation, including Tunisia’s foreign minister Rafik Abdessalem and the director of President Marzouki’s cabinet, will visit Gaza on Saturday to offer “all political support” to Hamas and increase Arab pressure on Israel. Egypt also made an appearance – prime minister Hisham Kandil visited Gaza earlier today to show support for the Palestinian people as well. What do these visits mean – and what real impact, if any, do they have on stopping Israeli airstrikes? Libya, Tunisia, and Egypt, are mired in tricky and messy transition periods. The real question that should be asked is whether these countries have the institutional and political capacity to leverage influence on the situation. The Arab League announced that it would be holding an “emergency meeting” for Gaza… on Saturday. This of course, is days after the aggression first begun. Today, the Iraqi representative to the League denied the existence of an Iraqi proposal to “look into” the aggressions. Best case scenario, the league will decide to simply denounce the attacks on a piece of paper. Few take the League seriously anymore, and its reputation has eroded decades ago. This leaves willing countries to take matters into their own hands and bypass the League altogether. But what can they do? While Tunisia and Egypt’s efforts are certainly noncommittal, they demonstrate a goodwill attempt to do something. However, to actually have any sort of impact, greater coordination and strategy is necessary. I leave this article open-ended for one reason: I want to hear back from any readers who may have thoughts on this. I have yet to articulate a clear vision as to what the next steps should be for Tunisia, Egypt, and Libya on this issue – and I will surely be writing on this once again in the very near future. Stay tuned. We all know that after former Tunisian president Ben Ali packed his bags, Egyptian Mubarak and Libyan Gaddafi soon shared similar fates. One was hospitalized for political and moral exhaustion, the other killed in what was a Hollywood-worthy (but slightly gorier) scene. Suddenly, the short-lived spotlight on Tunisia was quickly shifted to Egypt and Libya. The heavy news coverage in Egypt and Libya continues till this day. Tunisia was pushed back to, at best, starring on the headline tickers. The relative international media blackout on Tunisia-related issues, however, can put all parties at a disadvantage. What is at stake here? Some considerably difficult challenges lie ahead for Tunisia’s rocky transition to democracy. One would think that with all the talk—usually airy and empty—revolving around democracy, especially in the Western world, audiences would be interested in tracking one small country’s ambitions to build a pluralistic society; a country with relative geo-strategic importance perched on Africa’s crown bridging Europe, the Middle East, and Africa. Sure enough, once the country edged back into stability, news coverage on developments in Tunisia nearly halted. It is well-accepted in Tunisian folklore that the less attention one receives, the more successful the respective experience will be. “The evil eye is not easy,” it is said, and should be taken seriously. What is most alarming in the lack of media attention may reveal an undercurrent of interest-driven coverage in corporate media channels and another undercurrent of racism/otherness within the audiences consuming the news. The question, as most folks reading this probably realize, is: what news makes money? The second question is: why? The natural resources (read: oil) Libya has, and Egypt’s proximity to Israel, are two major factors that augment the level of coverage the two countries receive. One factor is material and reads dollar bills, the other is geo-strategic. Tunisia, with nary a natural resource to even sustain the country, does present a crucial interest of study in all countries and academics in the world. The plunge in news coverage on Tunisia exacts a heavy toll on academic efforts in the field of nation building and democratization. The country can be seen as something of a testing vacuum for democracy and Arab sociology. There are several reasons for this. The country is small, and has a relatively shorter list of “external factors” contributing to the ascension or descent of sociopolitical order—little foreign intervention contributed to Ben Ali’s fall, and most foreign governments took long enough to release statements endorsing the uprisings. It has been demonstrated time and time again that there is little vested interest in the country. Thus, organic movements can have a genuine chance to flourish. It is the perfect atmosphere, then, to put democracy to the test. Every Constituent Assembly debate should be recorded, transcribed, followed, and reported on, for every one of them reflects the societal nuances that are found all over the region. In constitution drafting, every word, letter, and conjugation should be noted. In the enumeration of presidential candidacy prerequisites, should the word “candidate” be conjugated in the female or male version? The market’s pulse—and how it changes depending on what type of economic system the country eventually adopts—needs to be monitored. What does it mean to go from a closed to an open market in North Africa? How will it contribute to the boom of exports, or the deterioration of the local currency? The conclusions that could be reached from such questions are crucial to our understanding of the modern world. The honeymoon-reporting phase is over for Tunisia. The euphoria of deposing a long-ruling dictator has ended months ago—a sentiment which could not be more acutely felt than in the country itself. Even when Tunisia does receive media coverage, it is plagued by constant comparisons with its neighbors. More than anything, apple-orange comparisons with Egypt and Libya rob audiences of understanding the social and economic nuances and contours between the countries. The countries’ diverse colonial history, for instance, impacts modern-day economics and legal frameworks. The Tunisian legal code is a near carbon copy of the French, which influences the methodology the constitution is being written in today. Egypt’s history with the Muslim Brotherhood is decades older than that of Ennahda’s, and the Supreme Council of the Armed Forces is a factor that cannot be ignored. Yet, a plethora of attractive factors still beguile media giants into treating the “Arab Spring” countries as a monolithic entity, with Tunisia receiving an honorable mention of “starting” the trend. There is more to the news than trendy appeal. There is more to the news than national interests. Serious and regular reporting about Tunisia’s internal challenges is absolutely necessary for our understanding of democratic development and post-Ben Ali North Africa as a whole. Original article posted on Jadaliyya. I should perhaps edit the title of this article to read, “The Libyan revolution and the impact on the left in the Global North,” — particularly the far left of Western Europe and the United States. While the vast majority of progressives in these regions are wary of NATO and its history, they do recognize the organization’s intervention in Libya as a humanitarian one. Yet, I have been encountering an increasingly prevalent level of push back regarding the intervention, and in some extreme cases, a downright delegitimization of the Libyan peoples’ struggles. Before I delve into my thoughts regarding the possible impact that this attitude will have on the left and its future relationship with a new Libya, both abstractly speaking and on a practical, domestic policy based level, I think the downfalls and dynamics of this specialized narrative merit serious mention. Several commentators (see Juan Cole’s “Top Ten Myths about the Libya War“) do a much better job at explaining some inadequacies of arguments raised by folks who are against the intervention – so I will leave that task to rest. However, I did want to point out that there is a stark contrast between the populace that holds this view in the US/Europe and that in MENA. In MENA, the narrative belongs to those who are defending the current status quo – and the leaders in charge of ushering and maintaining it (or were in charge, ie Gaddafi). In the US/Europe, it is narrated by those who are against western imperialism. In this case, the narrative inadvertently works to serve the purpose of the likes of Gaddafi, Assad, Saleh, etc. who – whilst holding their states’ developmental capacity and general civic freedoms hostage – maintain that the sole possible explanation for the rebellion of their people is due to infiltration from the West. This misguided narrative, most importantly, shows a severe lack of historical knowledge on the Libyan liberation movement. To claim that this is a “NATO war,” that “massacred an armed and civilian population”is irresponsible, unjustified, and groundless. It ignores the decades that the Libyan people – nay the people of North Africa as a whole – had to suffer at the hands of this merciless, insane dictator. It ignores how much of the country’s potential was wasted in favor of personal greed and power. It ignores the whips on an uncle’s back, and the bruises on the inside of a woman’s thighs. It ignores this. Further, it is an affront – indeed a dire insult – to the Libyan people, discrediting them of their desires, hopes, and suffering. There is no doubt that each country will want to stake its claim in a new, post-war, post-Gaddafi Libya: the country is resource rich and has a very real potential to end the relative economic dry spell plaguing the region. At the end of the day however, this is the Libyans’ revolution – those who were on the front lines had nothing to lose but their dignity. What possible indication do we have that they will be lead around like cowards by NATO? How dare we? In Part Two, I will be discussing the more internal impacts that these attitudes can have in the Global North, paying particular attention to the United States. I initially planned on having it in one entry – but the topic will be shifting a bit and it made no sense to have it all lumped into one. Note: this entry is temporally bound. Clearly, the situation may change in Libya – and then we may have real reasons to fear. But as it stands, the Libyans cried, fought, and died for their liberation. We must not only respect that, but deeply honor and admire it.